Sec. 61.53 Prohibition on operations during medical deficiency. (2) Is taking medication or receiving other treatment for a medical condition that results in the person being unable to meet the requirements for the medical certificate necessary for the pilot operation. (b) Operations that do not require a medical certificate. For operations provided for in Sec. 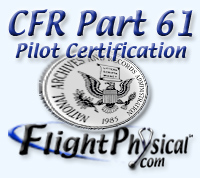 61.23(b) of this part, a person shall not act as pilot in command, or in any other capacity as a required pilot flight crewmember, while that person knows or has reason to know of any medical condition that would make the person unable to operate the aircraft in a safe manner. (1) Paragraph (a) of this section if that person holds a valid medical certificate issued under part 67 of this chapter and does not hold a current and valid U.S. driver's license. (2) Paragraph (b) of this section if that person holds a current and valid U.S. driver's license.